Wednesday, May 20 1908 -- We covered some of the explanatory ground for this cartoon last week, when Herriman reported on Theodore A. Bell taking over the helm of the California Democratic Party. 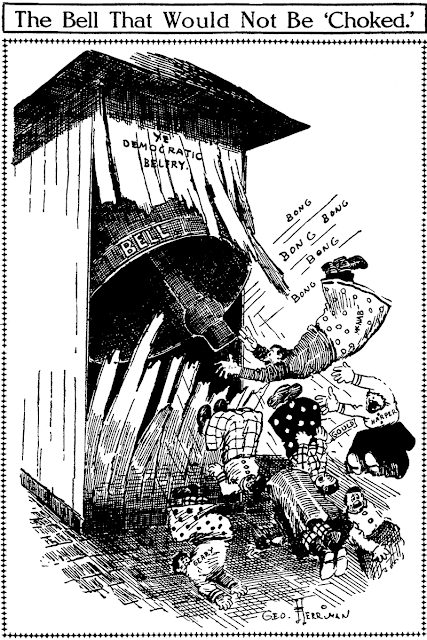 Today's cartoon shows what Bell and associates did as one of their first acts, which was to give the back of his hand to the delegation from Los Angeles. The story is long and convoluted, but suffice to say that serious charges were proffered against an L.A. delegate, R.F. Goings, for being a corrupting influence and a Republican infiltrator. Much shouting and some fisticuffs followed, and after the melee all the L.A. delegates were tarred with the brush of being pals of Goings and were censured. All in all, not a proud day for Los Angeles.